"These fabulous sandwiches feature pork shoulder that is slow cooked in a scrumptious sauce made with Campbell's® Condensed French Onion Soup, ketchup, vinegar and brown sugar, to serve on sandwich buns." Heat the oil in a 10-inch skillet over medium-high heat. Add the pork and cook until it's well browned on all sides. Cover and cook on LOW for 8 to 9 hours* or until the pork is fork-tender. Remove the pork from the cooker to a cutting board and let stand for 10 minutes. Using 2 forks, shred the pork. Return the pork to the cooker. Serving Suggestion: Serve with savory coleslaw with green and red cabbage, carrots and a vinaigrette dressing. For dessert serve ice cream sandwiches. This recipe was great! Everyone at our party seemed to like it and a few asked for the recipe. 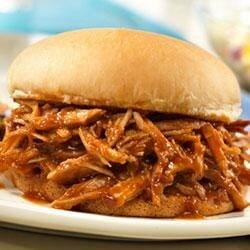 Best pulled pork ever.Easy,and delicious.I added 2 cups of my favorite BBQ sauce to the other wet mix,came out sensational.so easy to shred it just fell apart.Yummy!! !